I would like to start a thread that captures those buildings along the roadside whose days of glory are in the past and now wait for time to take it's ultimate toll. During my road trip travels I am always on the lookout for those buildings that were once part of the road trip experience but are now likely relegated to a distant memories of road trips past. 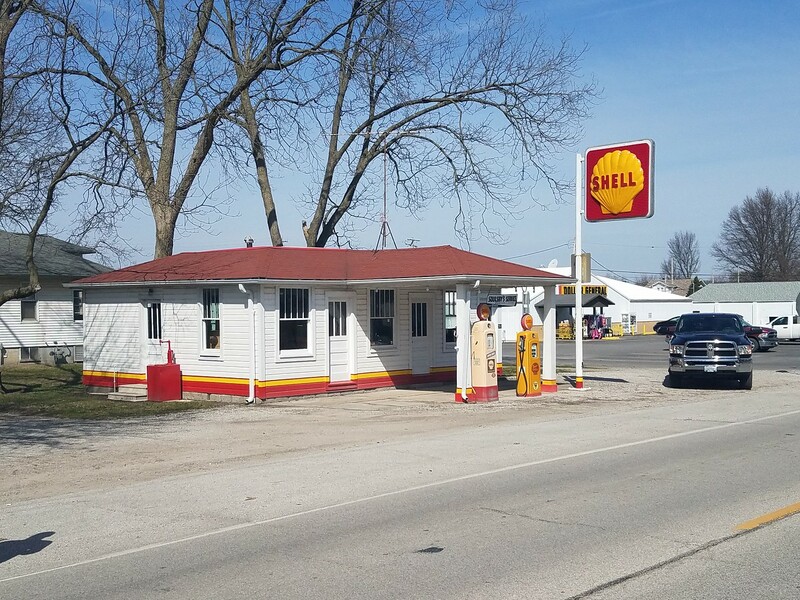 Whenever I pass through a small town, or along what was once the major thoroughfare through an area that is now bypassed by the Interstate, I always keep an eye out for that former gas station, diner, or motel. Sometimes they have been repurposed to fulfill another roll, others are in a state of suspended animation, but many times they are abandoned likely to never be a stop along the highway again. 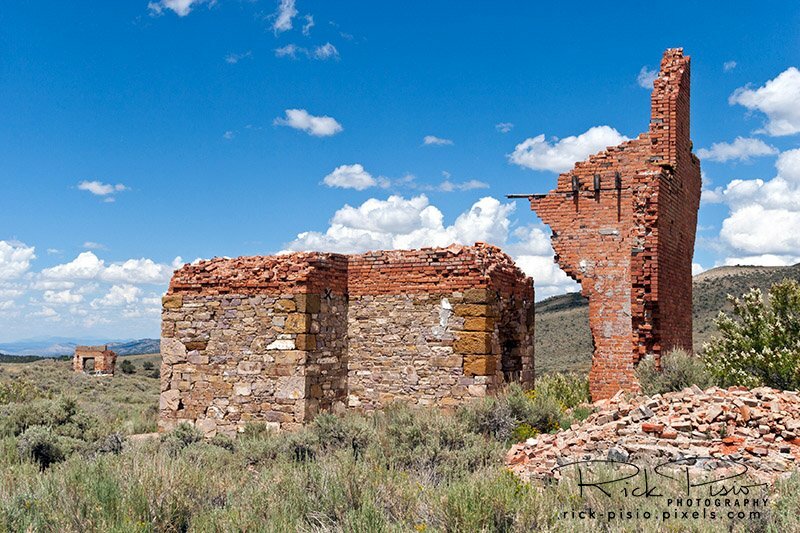 In the 15 or so years that I have taken an active interest in the history of the American road I have had the opportunity to visit sites multiple times seperated by a few years and have witnessed the accelerated decay of some of these buildings, some are even gone completely. The "Kamp"ground office at Two Guns is an example that comes to mind. Each time I pass through that area east of Flagstaff I pull off the Interstate and take a look. Each time there is more grafitti, less of the buildings siding intact, and more of the interior exposed to the elements. I'm sure there are many more examples out there and I hope you will share some of what you've seen. I'll start with an iconic building that I have attempted to reach 3 times, once successfully, but don't expect to see the next time I pass through Arizona. 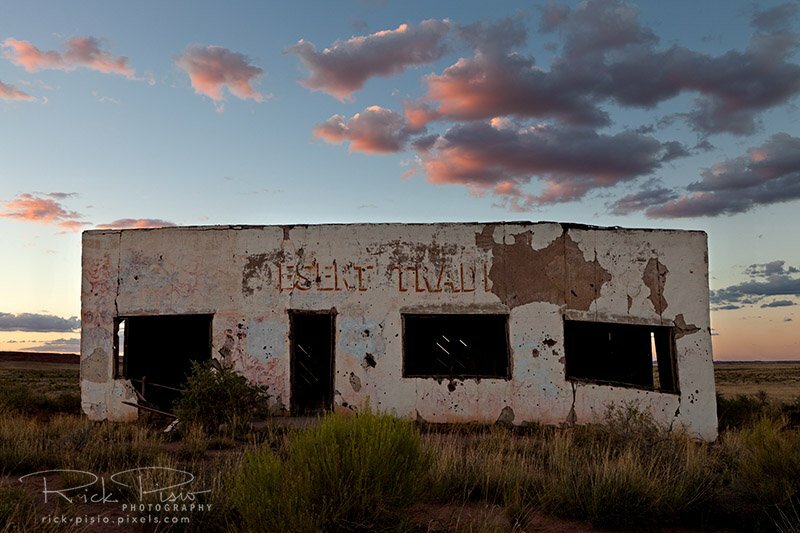 The Painted Desert Trading Post stands in the middle of nowhere, east of Painted Desert National Park, and nearly inaccessible. The section of Route 66 that this building sits on was bypassed sometime in the 50's and like many Route 66 buildings that lost traffic to the Interstate it eventually was abandoned. It has survived the 70 or so years since it last saw customers only because of its remoteness. Time and the elements have taken their toll however. When I was last there the east side of the building has started to slip, the stucco was flaking off, parts of the walls are gone, massive cracks are present in the foundation, and you can see the sky through the roof. There may be hope for the old gal yet. As I was writing the draft for this post I was looking online for some information and came across this article. It would appear that a group has purchased the land and the building with an eye to preserving the structure. I wish them the best of luck! I will take up your offer to add to your excellent post. Click below. That is outstanding and exactly what I had in mind. If one picture is worth a thousand words then your sense of history and skillful writing multiplies that by at least a factor of 10. I can see the scene exactly as you describe it. The photo itself has such depth with the wide open desert surrounding it and Mt. Hood standing tall behind it. The structure looks forlorn and forgotten, the echoes of laughter, fiddles, and accordions long since faded away. It's also very timely that you would choose that location and subject. I have been researching and planning a trip to that area in the (hopefully) not to distant future and finding this building would be an objective of that trip. I hope that the building is still standing for me to find. Thanks for your feedback! I recall that you were headed to that area soon. 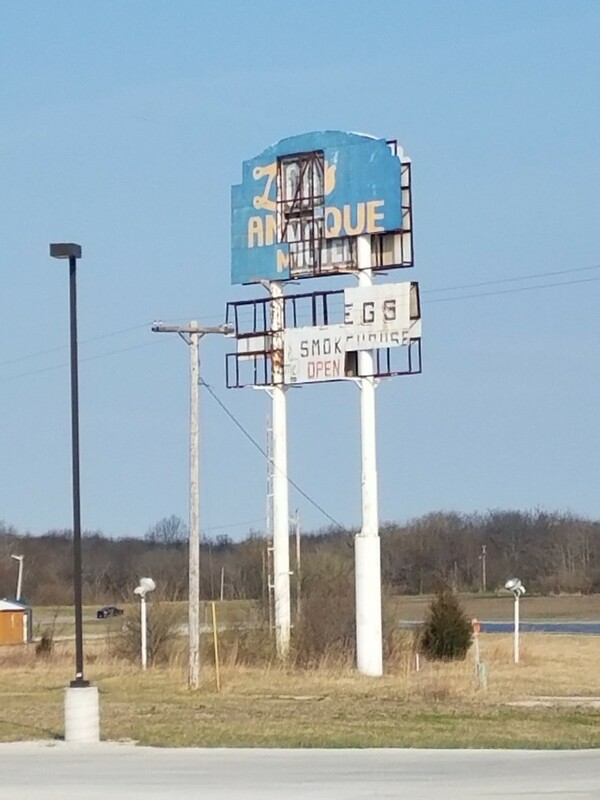 I do hesitate to advertise the locations of fragile roadside architecture, but at the same time, why tell about them, and not share how to find them. The area south of The Dalles within a ten mile circle around Dufur, Oregon is unusually rich in structures from early last century. I meant to write and share more about the area after my visit there in June, but have not until I read your post. I will do that, but probably not before you leave. So I will provide you and others a very quick guide to a very interesting and under appreciated area. Any good map will guide you to these places. Dufur, is a classic 1900 town. I have photos from 1912 that practically match perfectly with shots taken today. The general store is a live gem, and the Balch Hotel (stay there if you can) is a pure joy from 1907, and not only authentic, it is finely appointed and comfortable. You can read my review on Trip Advisor. Friend is on the old road that replaced to road via Boyd and getting there will take you along parts of the old Barlow Trail of Oregon Trail days.. Friend itself was the terminus of the Great Southern Railroad, and has an abandoned pioneer general store and one room schoolhouse, against a backdrop of Mt Hood. 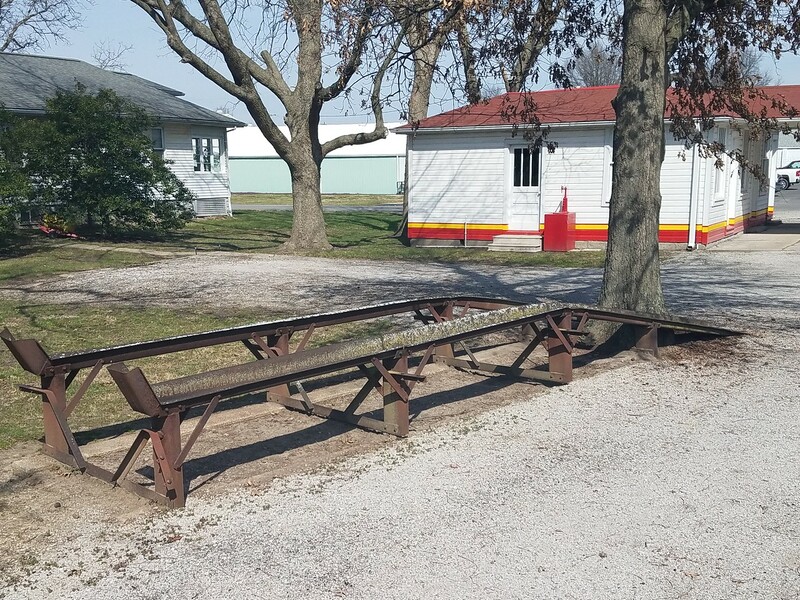 Tygh Valley is a small farm community on the Barlow Trail with a general store and small cafe and on the outskirts, a storage yard for old amusement rides. East from Tygh Valley is the very early White River power plant in a spectacular canyon, at the base of a fantastic waterfall. 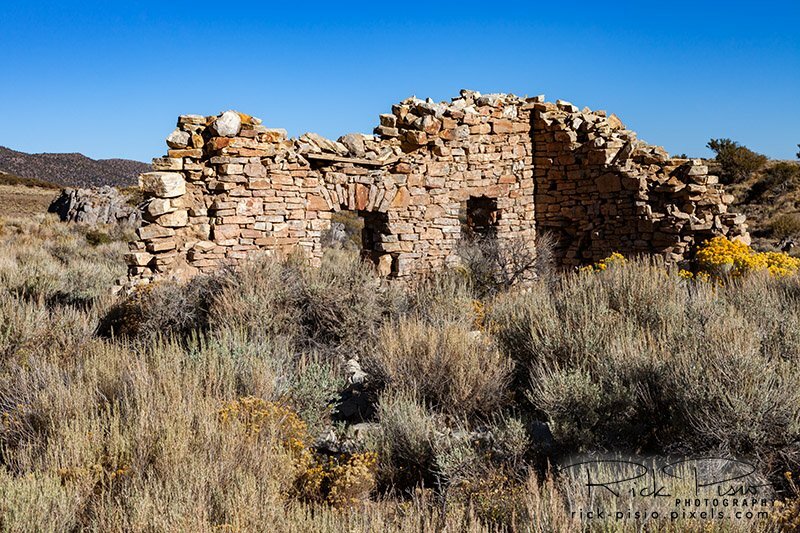 There is a trail down to the abandoned powerhouse, and I believe it still has much of its huge equipment…..but I need you younger guys to do the photography as I would probably need a medivac on the climb back out of the canyon!! Further east you drop into the Deschutes River canyon to a pioneer bridge crossing. You can see the stage road clearly on the canyons east side, watch Native Americans fish from shaky platforms over a waterfall as they did 150 years ago, and if you wish, drive on to Bakeoven and Shaniko with the Columbia Southern Hotel from the turn of the last century. That is a very quick summary to help you with trip planning! Forgive the lack of photos, maps and details….for now, but I wanted this to get to you in time. That is great info Dave. My road trip to that area is still off a bit in the future, and a bit fluid in regards to timing, so I still have time to research the routes and locations. The White River Falls area looks very interesting and hiking down to the power plant looks worthwhile. Thanks! One unusual thing I did notice was east of Grass Valley off of Hwy 97. That's a nice looking road course out in the middle of nowhere. Build it and they will drive? I have followed the Oregon Trail in that general area….years ago. The Trail forded the John Day River at McDonalds (25 miles northeast of Grass Valley) and as I recall the pioneer auto road went from Wasco to Klondike, then across the John Day there also. Klondike had an abandoned general store when I visited, but it is one of those roadside artifacts that are gone. But there may still be a brick schoolhouse at Klondike. Google Earth will get you oriented to these sites. South of Grass Valley is an abandoned service station worth visiting at Kent. In fact Kent is definitely worth a stop for old buildings. Minor correction: The correct name of the national park is Petrified Forest National Park. The Painted Desert itself occupies the northern third or so of the park, and extends outside the park boundaries to east, north, and west. 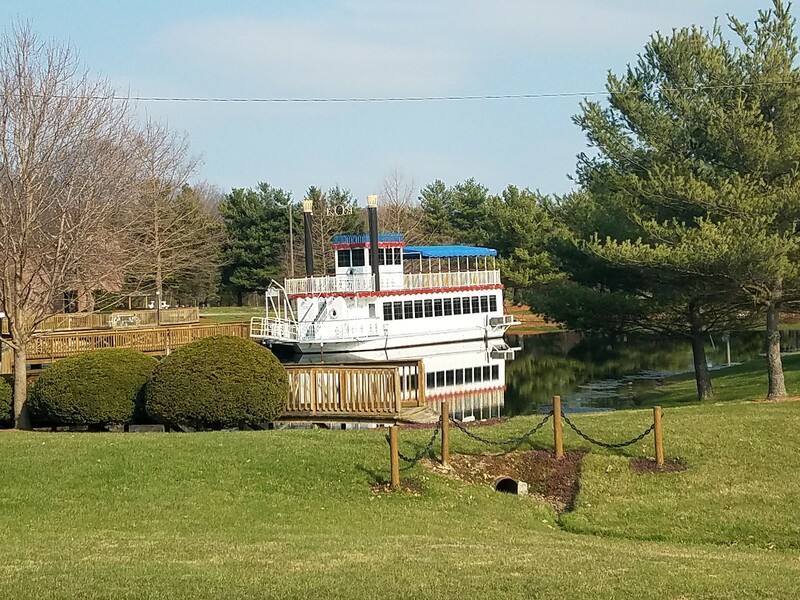 The entire park is a wonderful place. Thank You mga707, my proofreader and fact checker must have been distracted. And yes, I agree, the entire park is a wonderful place. 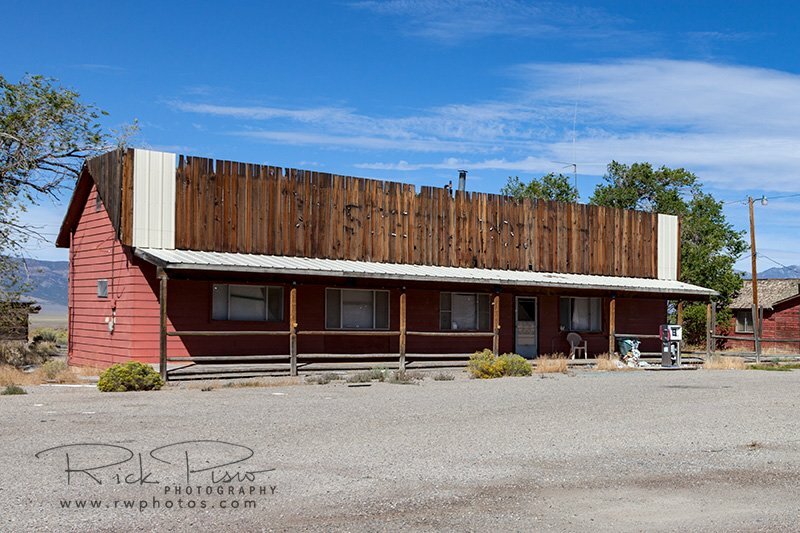 I was traveling east on the Reno Highway, US 50-A, having just passed through Fernley headed towards Fallon and points east when my eye caught the Hazen Market sitting on the north side of the highway. The building looked to be no longer in use but in good shape overall with the exception of some weathering on the facade. After taking a few pictures I moved on, postponing any research on the building until after returning home. 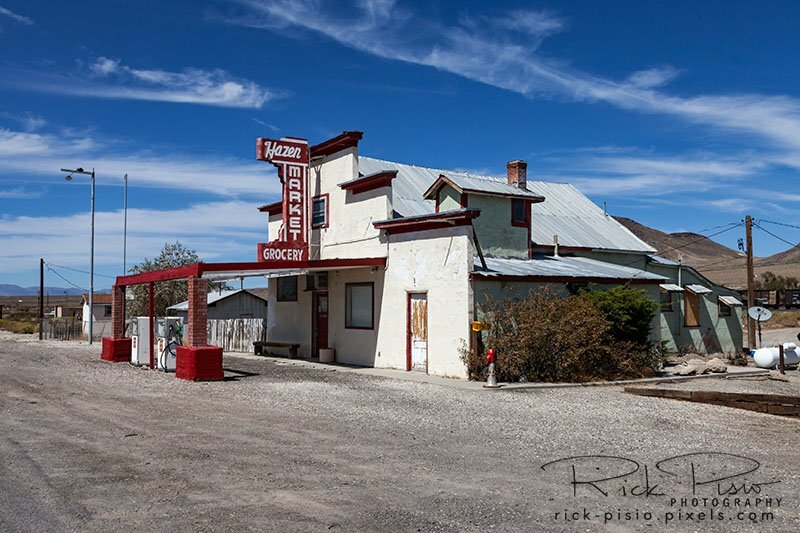 "The Hazen Store is a small complex of buildings in Hazen, Nevada, listed on the National Register of Historic Places. 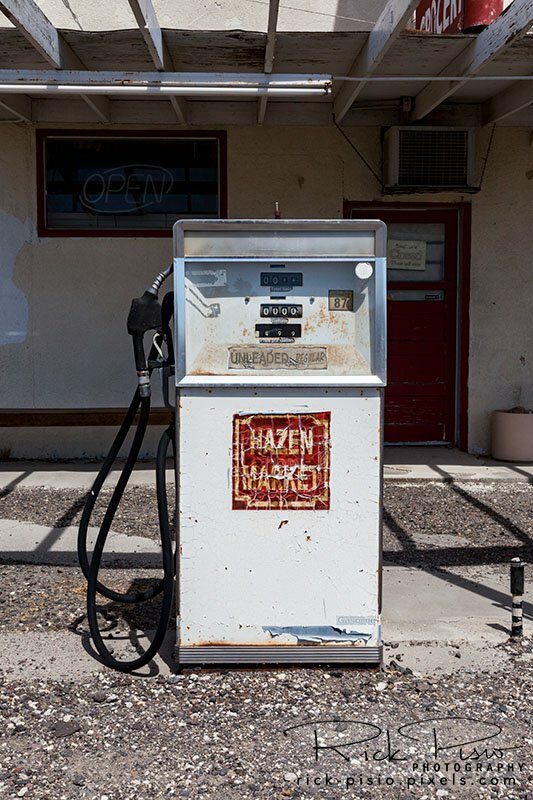 The store provided a stopping point in a remote portion of U.S. Route 50 and served as a focal point in the small town of Hazen. The store was built in 1944 to replace an earlier store that was demolished to make way for a realignment of Route 50. 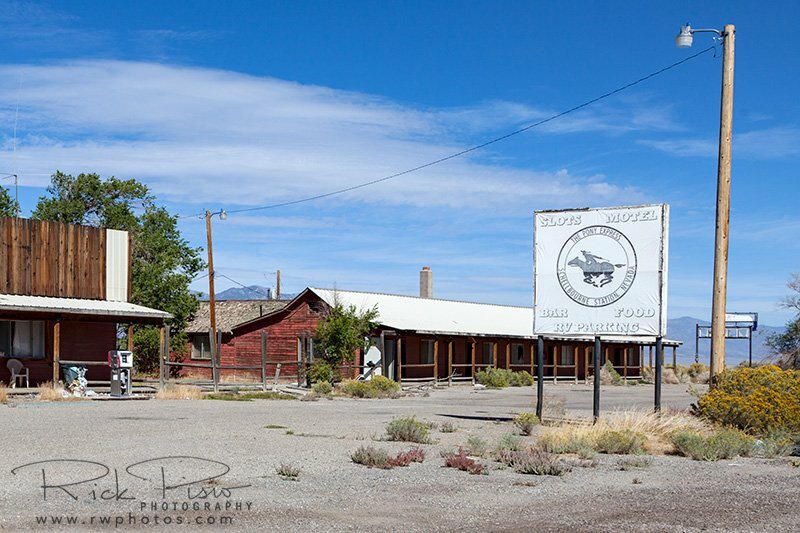 The property comprises the main store, a garage, and a bunkhouse formerly used by the Southern Pacific Railroad. The central portion of the structure dates to about 1904, operating at a different location as a saloon called Shorty's Bar until it was relocated in 1944. 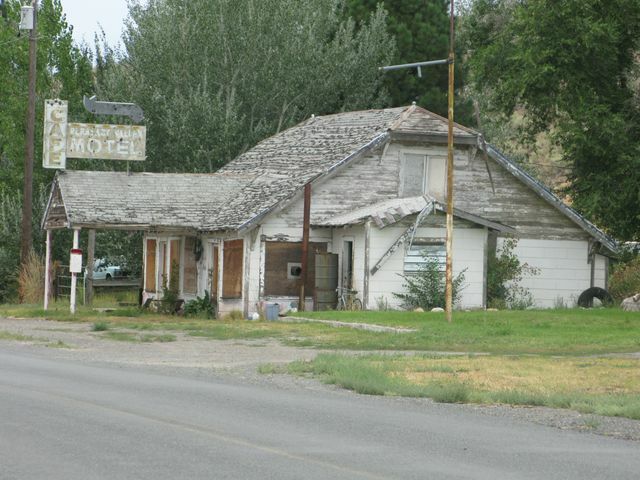 The Hazen Store was listed on the National Register of Historic Places on January 28, 2002, as an illustration of a commercial property on the Reno Highway"
I also found this article from the Lincoln Highway News from 2008 that shows the building all shined up and looking for new occupants. It's a shame that after 70 years of business the Hazen Market has sat idle for the last 10 watching watching the traffic pass it by. Eastgate Station sits on Nevada Highway 722 and between about 1924 and 1962 was the route of the Lincoln Highway and US 50 through the area. In 1962 US 50 was re-routed to the north through New Pass and Cold Springs, bypassing Eastgate. Keep the Show on the Road! had previously posted some excellent historic photos of this site in the Lincoln Highway forum. I have been to this site twice now with an 11 year span between visits. On my most recent visit in Sept 2018 the building looked about the same as it had on my previous visit with the exception of the roof. However, on my previous visit the shingles were, for the most part, intact. This picture by Russel Rein was scanned from Brian Butko's "Greetings From the Lincoln Highway" and looks to be from the late 50's. Today the form of the building is recognizable, the slope of the terrain has been altered, the gas pumps are long gone, and the shingles have departed the roof but the flagpole still remains. I recall the station well! And I appreciate your modern photograph! Is the adjacent house still standing? Circumstances (primarily my wife's health) are curtailing my long distance road trips these days, but your posts are a valued substitute!! And my advice to anyone reading this is to visit these places as Rick says, while they are still there, and you have the opportunity. I am really glad I did!! I'm very sorry to hear about your wife's health and hope that it improves soon so that The Rose can get back on the road. The house at Eastgate is still standing and it looks to be in good repair. I'm not sure if it is occupied but it does look like there has been recent work done inside, although I couldn't tell how recently. On my first, and only previous, drive on Nevada Highway 722, eleven years ago, I passed by Carrol Station without even seeing it. I was looking for a spot on the actual summit when in fact the building at Carrol Station lies east of the summit by about 3 miles. I'm not sure if it was the foliage surrounding it or I was distracted by the road itself but I totally missed it. This time around I made sure to have the GPS coordinates locked in and my eyes open. 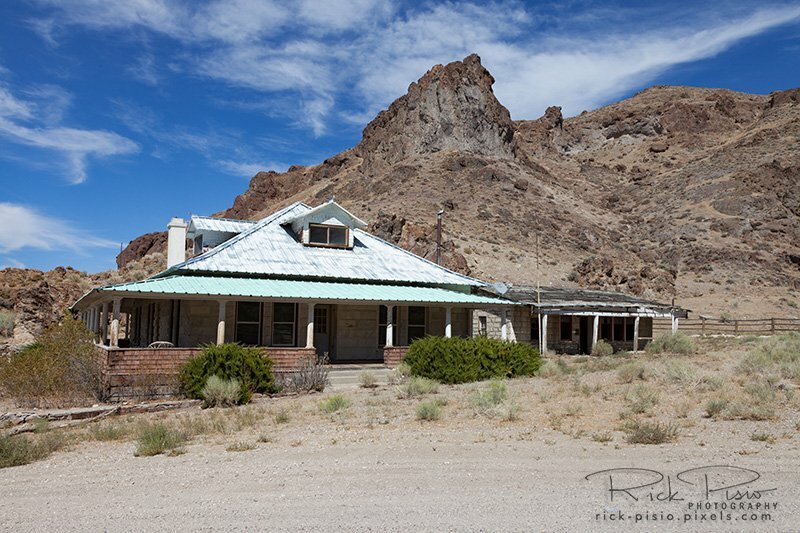 There's not a lot of history to be found regarding Carrol Summit other than it was once a Texaco station and also the local watering hole for the nearby mines, which were not very successful. 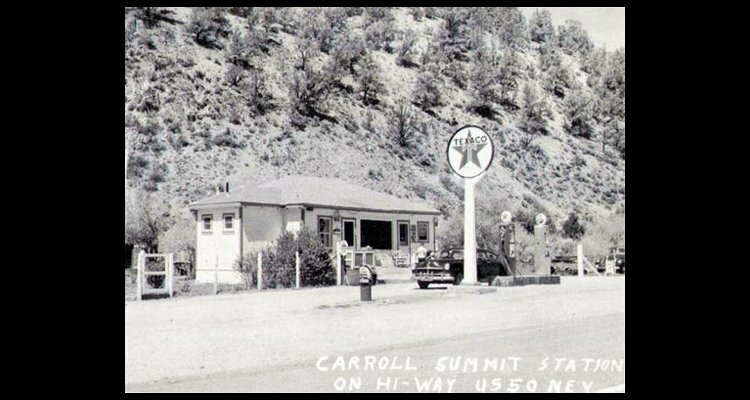 One report speculated that in the early days of auto travel it would have been a good place to stop after the long climb over Carrol Summit when heading east and also a good place to stop and let the engine cool before the final 600 foot climb to the summit when heading west. The station itself likely didn't last much past the re-alignment of US 50 that took place in 1962. It's difficult to imagine a gas station staying profitable when the highway traffic has be rerouted 23 miles to the north. Today the Texaco colors have faded and, all the window glass and doors are missing. Many of the floorboards are missing and interior walls have been stripped away. I always like to check the condition of the roof as once that protection is gone the degradation of the building itself seems to accelerate. In this case the shingles on the roof are mostly still present but extremely worn and crumbling. Approaching Carrol Station from the west. Carrol Station Texaco with concrete sign foundation. No sign of the gas island. 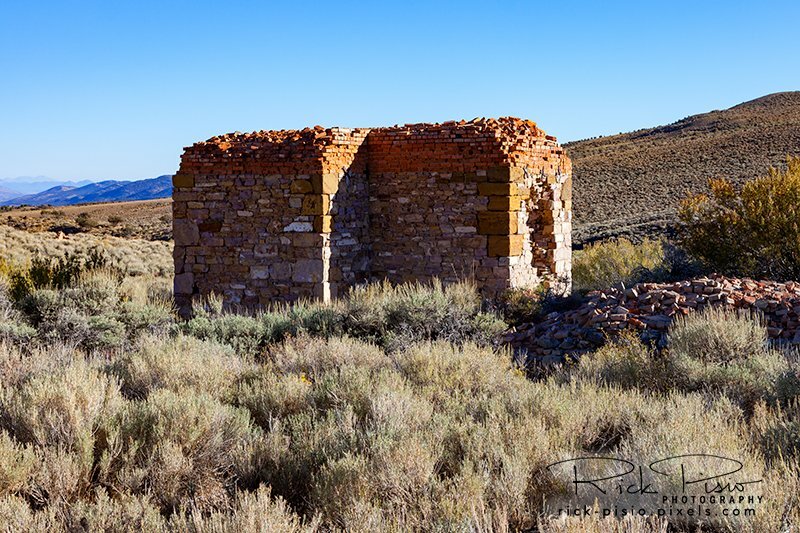 For a few short years Hamilton was the prominent mining town in Nevada's White Pine County until the ore ran out. 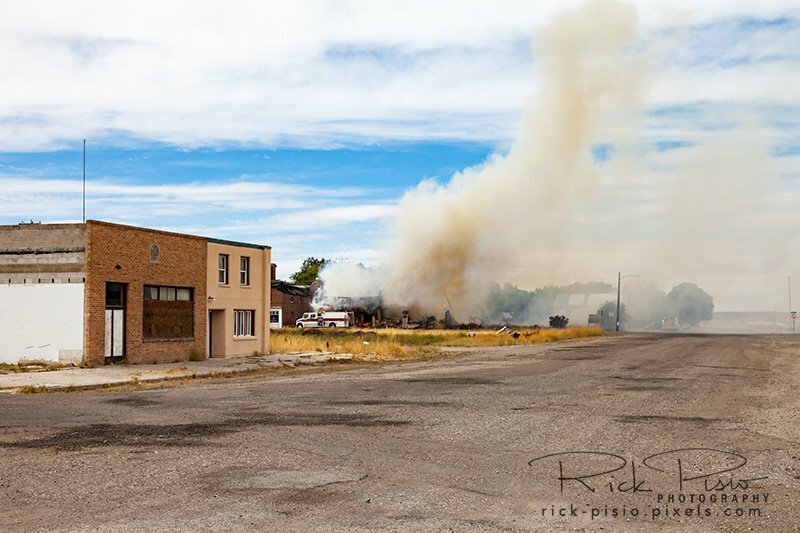 Founded in 1868 the town was already in a state of decline when most of it was destroyed in 1873 by a fire that was intentionally set to collect the insurance money. Hamilton hung on after the fire as its population declined and for first couple of years of the Lincoln Highway it was a place to stop before a bypass was cut over Antelope Summit 10 miles to the north. The Hamilton Post Office finally closed in 1931. 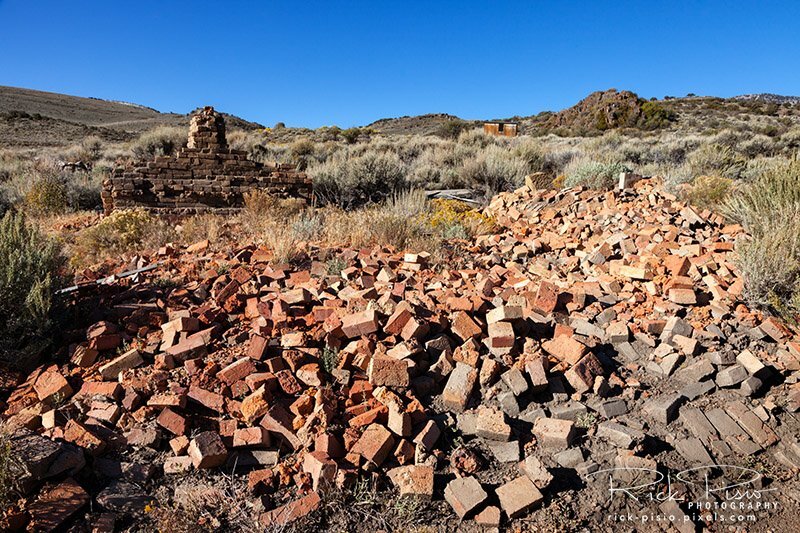 Today, piles of brick, scraps of tin scattered in the sage brush, and a few remnants of brick walls are all that remains of the original boomtown. 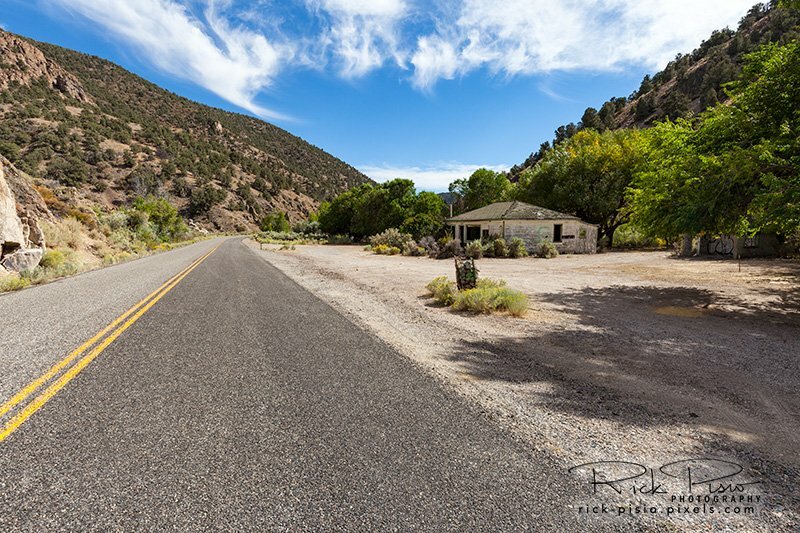 The State of Nevada promotes the path from US 50 at Ilipah to Hamilton as a scenic drive and is well worth it if you don't mind a little bit of dust on your tires. The road is easily passable by a passenger vehicle during good weather but a high clearance vehicle is recommended during rainy season when the dirt & gravel road is wet. The road is closed during the winter months. Since my previous visit to Hamilton in 2007 there has been a noticeable decline in the number of free standing rock and brick walls. Back then there were a few archways plus some almost complete walls still standing. Today most of those structures have all collapsed. 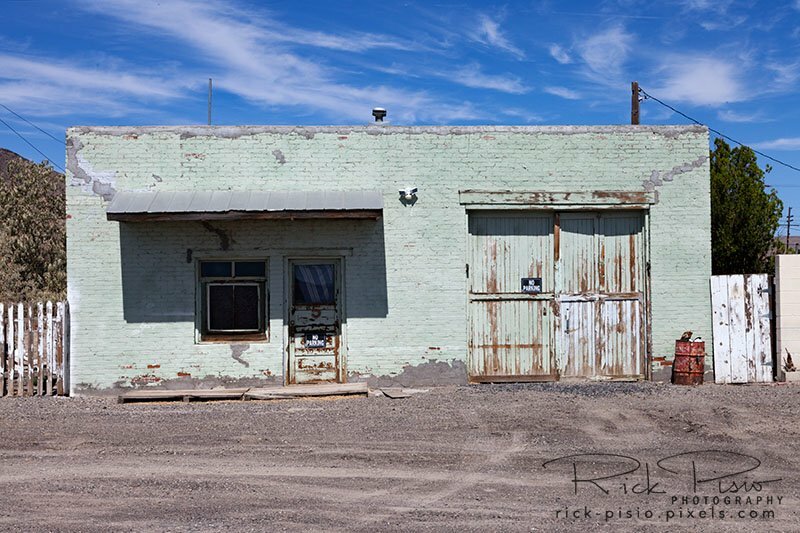 There is a 1950's era, maybe 1960's, mining operation set up at the southern end of town with a steel shed that is still standing but it too has been vandalized with doors ripped open and bullet holes in the steel walls. Photo from Ghost Towns: How They Were Born, How They Lived, and How They Died by Tom Robotham (Running Press, 1993) gives an idea of what the main street in Hamilton once looked like. This photo of the remains Whitington Hotel was taken in July of 2007 during my first visit. 2018 view of the Whitington Hotel from approximately the same position as 2007. One of the few remaining walls along the main street that is still standing. Piles of bricks where a building once stood. Whenever I am exploring an abandoned piece of property I always wonder what life was like for the people that used to live there, like I am sure a lot of us do. Sometimes I leave with an impression based on something I've read or knowledge I might have but more often than not I leave with nothing more than a few photos of what a place looks like at the time. The rest is a mystery. 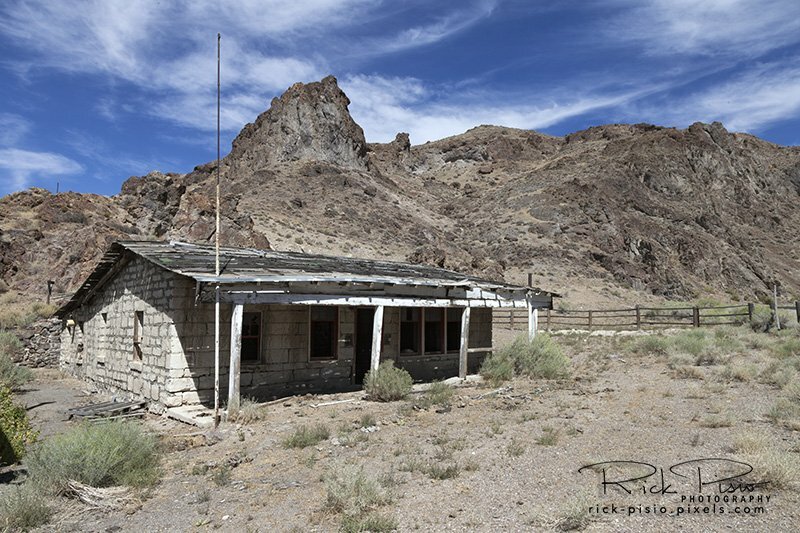 The photo below was taken in November 2009 on a journey to the Mojave Desert. 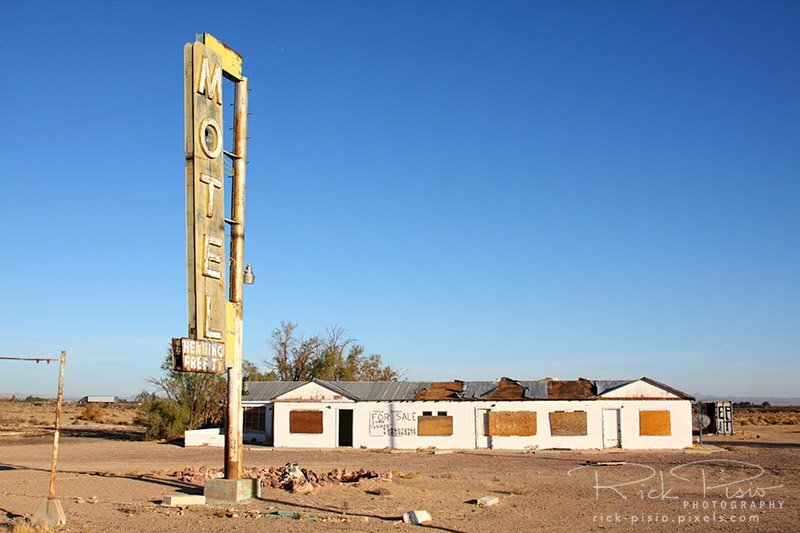 The Henning Motel was located in Newberry Springs which is roughly 20 miles east of Barstow along Route 66. It was a crisp November morning when we stopped, looked around, and took some photos before continuing east. When I got home I edited the photo and posted it on my website. On a trip along the same route a few years later I noticed that the building had been razed. This morning I got an email in my inbox that made me glad I took the photo when I did. Betty Phinney has sent you an inquiry. I was viewing your photos of Rt 66. 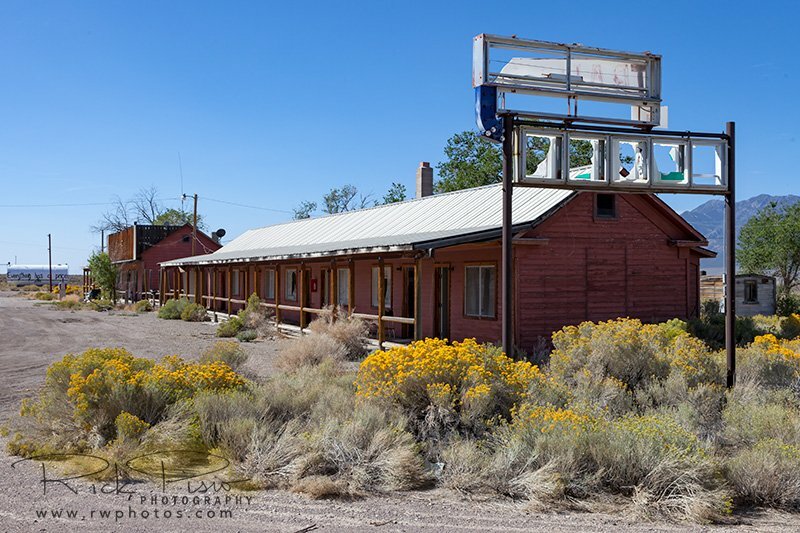 I came across the photos of Motel Henning with Free TV in Newberry Springs California. My parents built the motel sometime in 1948. A tornado hit the motel when I was probably 4 or 5 years old and they had to rebuild. I remember it took the roof off and we had nothing much left. My sister was the only injury, she was hit on the head with a large brick. They sold the motel years later and we moved to Barstow. My parents names were Neil and June Peddie. There use to be a house next to the motel. My aunt and uncle lived there for years. Their names were Bruce and Nora Brander. We kids use to pick up pop bottles and turned them in for the deposits at the store next to the motel, it might have been where Bagdad Café is located. We would buy candy with the money. Your photos brought back a lot of memories. Believe it or not we kids always found something to do. Wow! Thank you. Now I have a glimpse of what life was like when the Henning Motel was in its prime. I might have something to contribute.....Back in a minute. Restored Shell Station in Mt. Olive IL on Rt 66....but I don't remember which alignment....one of the older alignments for certain. Someting tells me this ramp has been here a while! Old Motel/Restaurant sign that has been repurposed.....at least once! Located on one of the later alignments north of Litchfield, IL. I've been by this place for yEARS and never saw this. I have no idea when it was put there or for what reason, but it is just off I55 along 66 and hidden by the trees. 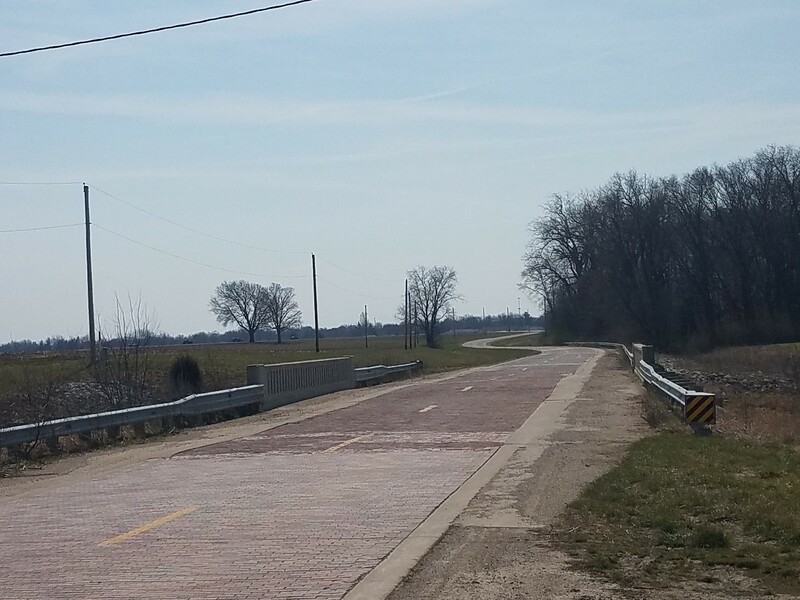 Not a building, but an old brick road from an early RT 66 alignment south of Chatham, IL. And here is a very interesting tidbit....not about the highway, but rather something to see in Springfield, Il. Just who was Fleetwood Lindley? Fleetwood Lindley was born on April 4, 1887 and died on February 1, 1963. He was a florist by trade and led a mostly unremarkable life. He was also President of the Board of Directors for Oak Ridge Cemetary where both he and President Lincoln are buried. But, they have more in common than just being buried within a few hundred yards of each other…..Fleetwood Lindley, was the last man alive to have seen the face of Abraham Lincoln. A little explanation is in order methinks! Fleetwood’s Father, Joseph Perry Lindley, was a member of the Lincoln Guard of Honor. This group was formed following the attempted theft of Lincoln’s body from the original tomb in November of 1876. During the reconstruction of the tomb in 1900-1901, it was planned to bury Lincoln’s casket in a steel cage 10 feet underground and cover it with concrete to prevent any more attemps at stealing the body. The casket would be sealed away for eternity. “His face was chalky white….” As spooky as that sounds, it was apparently caused by attempts to lighten his face during the trip from Washington to Sprinfield. There was no doubt who it was however. It was the unmistakable face of Abraham Lincoln. Strangly, Fleetwood Lindley retold this story to Life magazine on January 29, 1963, but he would never see the article published. 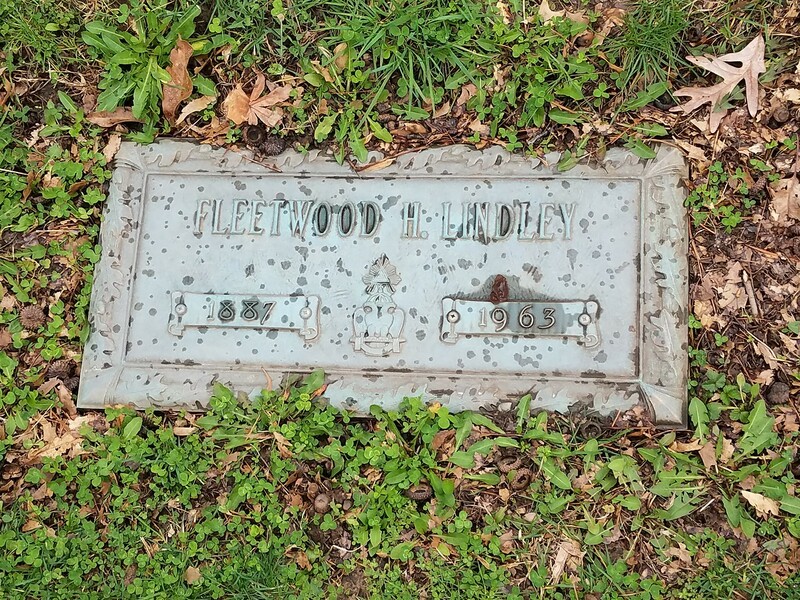 Fleetwood Lindley passed away on February 1, 1963…a mere three days after the interview. We visited both Abraham Lincoln and Fleewood Lindley during our time in Oak Ridge Cemetary. This was copied from my blog entry about the Lincoln Tomb and Fleetwood Lindley. I regret not reading your post sooner. Even we old guys can get busy!! What an absolute joy to hear from her. That is a very rare treasure we roadies get, perhaps just a few times in our lives. But it is the golden prize. I hope Becky picks up on this. It is truly brings history alive. Terrific!! It is so good to see your great materiel. And I do remember the motel. Family limitations are keeping me home a lot more than I like so seeing the photos from you and Rick keep the juices flowing. Thanks for pitching in. I wonder if that Shell station was ever that clean while it was in use? Back in my past I often had to travel to Chicago for business, specifically the Skokie area, but unfortunately it was before I knew much about road history or Route 66. Before one of the last trips to Chicago I picked up the "Route 66 Traveler's Guide" by Tom Snyder at the newstand before boarding the plane and the spark was lit. All the weekends that I was stuck in Skokie and could have been out exploring Illinois if I had only known. The Motel in Durkee is one of those I always hope to find while traveling along the road. Such character in the design and what time has done to it over the years. I hope it sticks around long enough for me to find it. I though you might appreciate that note from Betty. It was a first and certainly a welcome surprise to me. Sometimes you get to see the change as it is occurring. Wells Nevada was once a railroad stop, a town along the Victory Highway, a stop for the night along the US 40, and now a gas stop along Interstate 80 before driving to Elko or Wendover for the night. 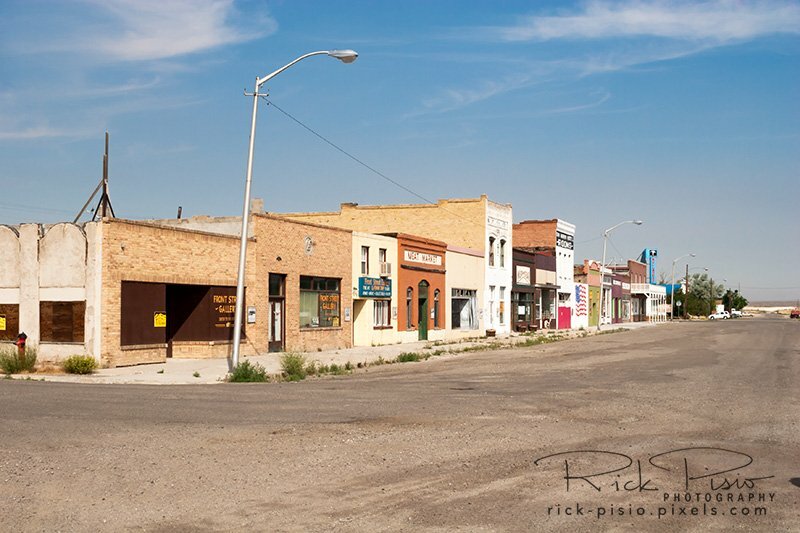 Prior to the earthquake on February 21st, 2008 the row of storefronts along 7th St that dated back to the time of the Transcontinental Railroad were a premier example of western railroad towns. In 2007, when the photo below was taken, many of the shops were still open. In the case of the Meat Market it wasn't open but still had meat grinders and slicers on the countertop with the meat cases still in place. When the earthquake hit it damaged nearly all of the historic buildings to the point that they could not be repaired and had to be torn down. When I visited again in Sept of 2018 the row of stores along 7th St. was completely gone. Photo below was taken at approximately the same location as the 2007 photo. The smoke in the background? Another building gone forever. 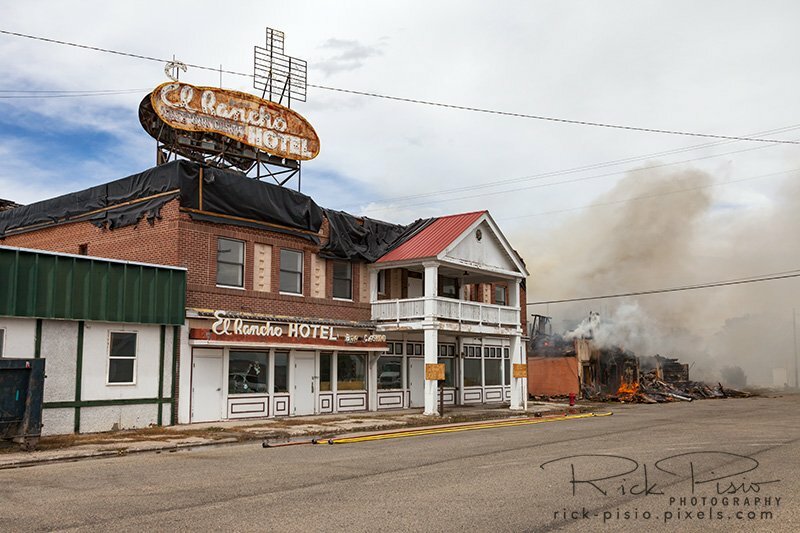 The building was next to the El Rancho Hotel on Lake Ave. The firemen didn't even try to stop it from burning, only making sure that it didn't spread any further. I'm not sure what the building was built for originally, or used for prior to burning, but it certainly looked old. Image is from Google Earth. desert landscape but the 6 room motel with the roadhouse next door will have to do. Wendover was still at least an hour down the road, if not more. It was one step above pulling onto the side of the highway and sleeping in the car. it did was make it impossible to back the station wagon up in front of the room and do a straight in unload. We were back on the road before the sun was up. 93. I do have vague recollections of it looking open on either my 2007 or 2011 trip through that are but neither the 2006 or the 2011 google images show any cars in the parking lot. We didn't explore it either time. gambling machines or even a small casino. This is like a feast of recollection and reflection, with a big dose of fine writing. 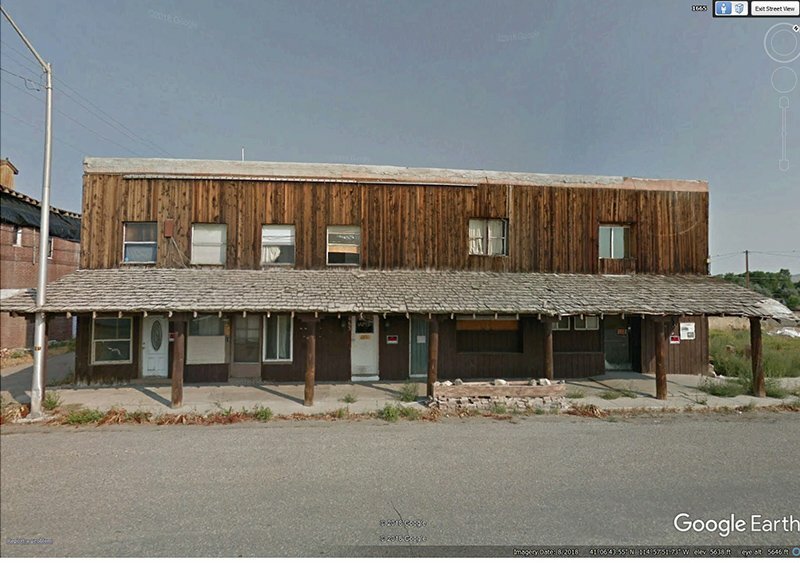 I recall that motel….it was probably 10- 15 years ago and Sheila and I were following the Pony Express route. We didn’t stop. The post below gives a bit of the history of the motel. It still had cars in front based on the 1999 Google Earth image. 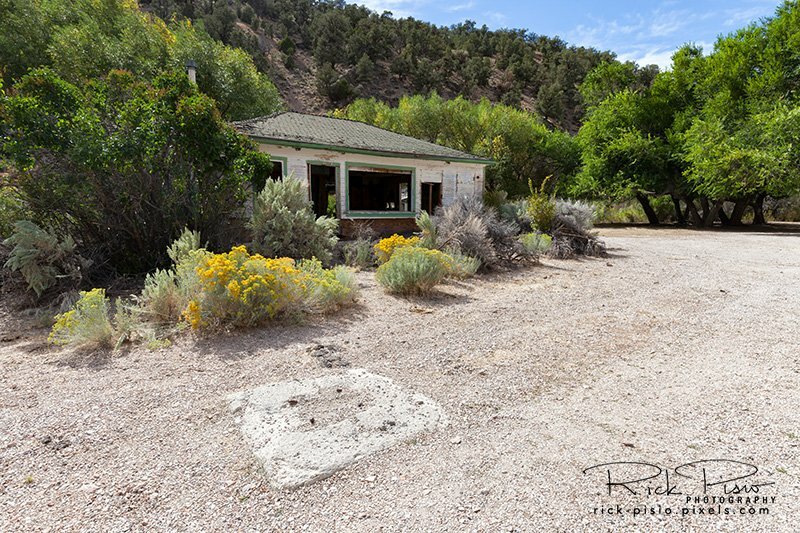 You could have owned a piece of Nevada history, a motel, and RV park for just $225,000. Guess no one wanted to!! 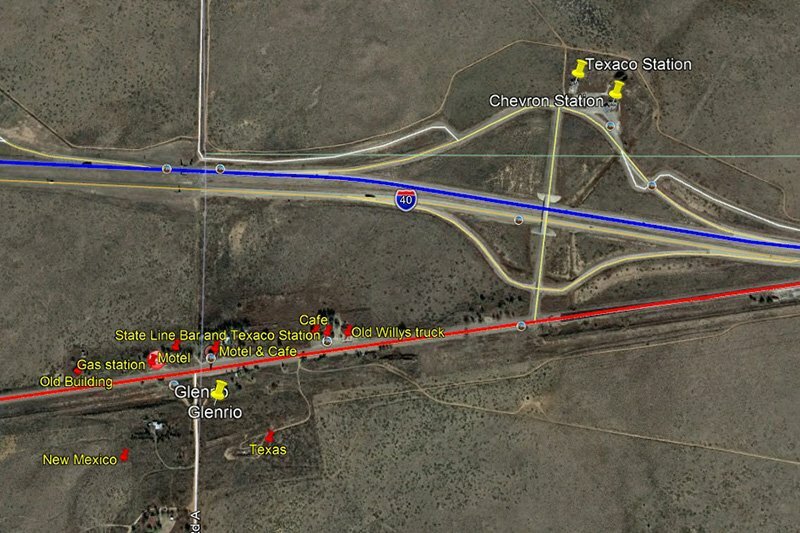 Along Interstate 40, at the state line between Texas and New Mexico, sits "Exit 0." 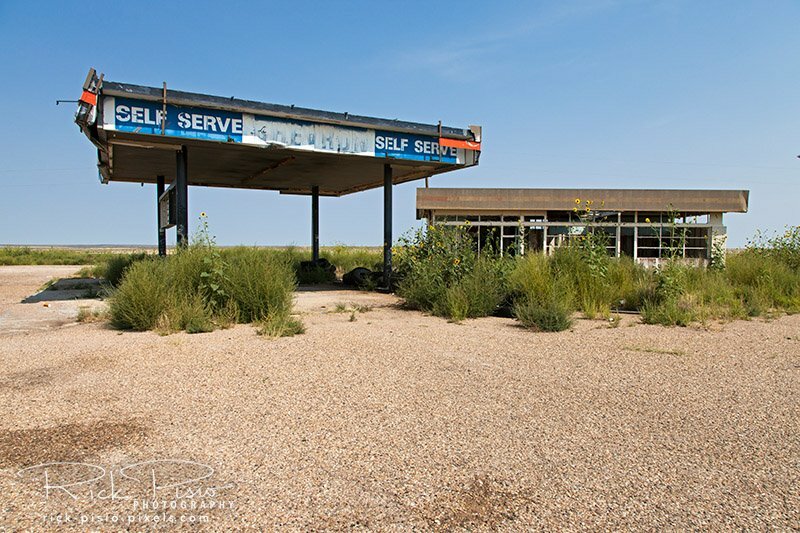 On the south side of the Interstate sits the Route 66 ghost town of Glenrio but at the exit itself there are 2 abandoned service stations on the Texas side of the state line. It was 1980 when the Interstate bypassed Glenrio and shifted traffic north of the town. 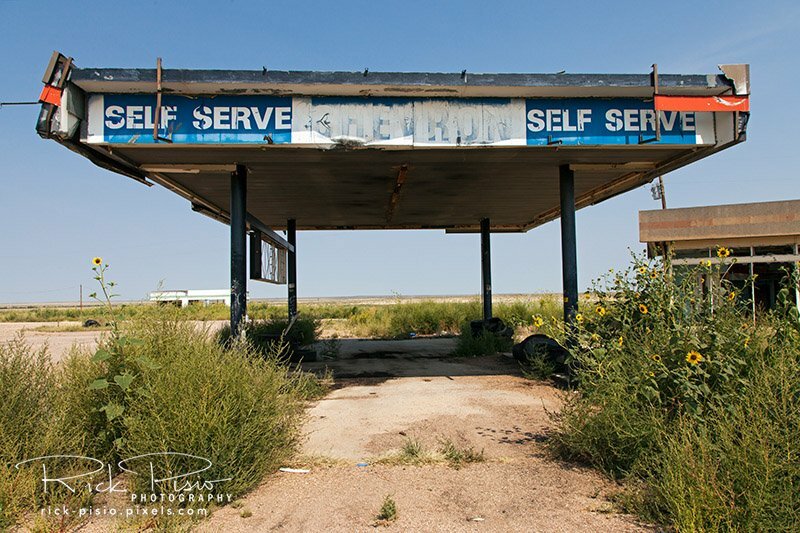 It is also likely that sometime around that time period that the two service stations were built. Not sure when they serviced their last customers but today they are left abandoned and exposed to the elements. Pump islands at the abandoned Standard\Chevron station in Glenrio, Texas. 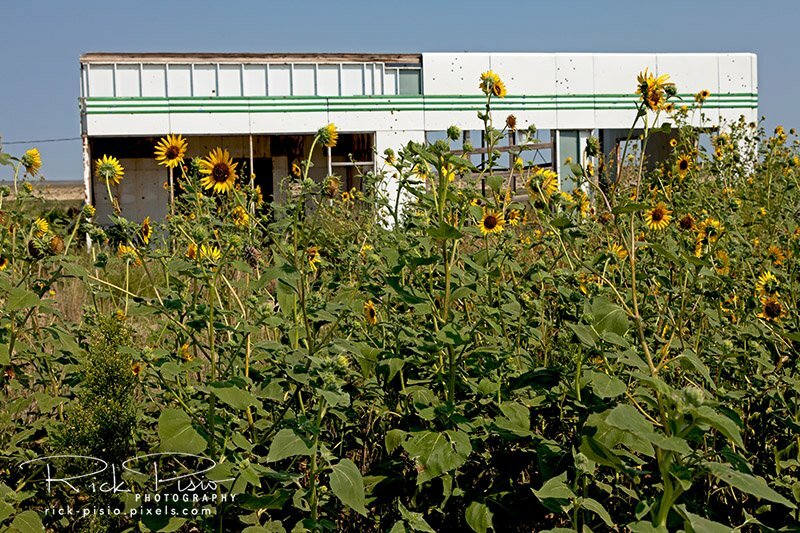 Wild sunflowers at the site of an abandoned Texaco station in Glenrio, Texas. 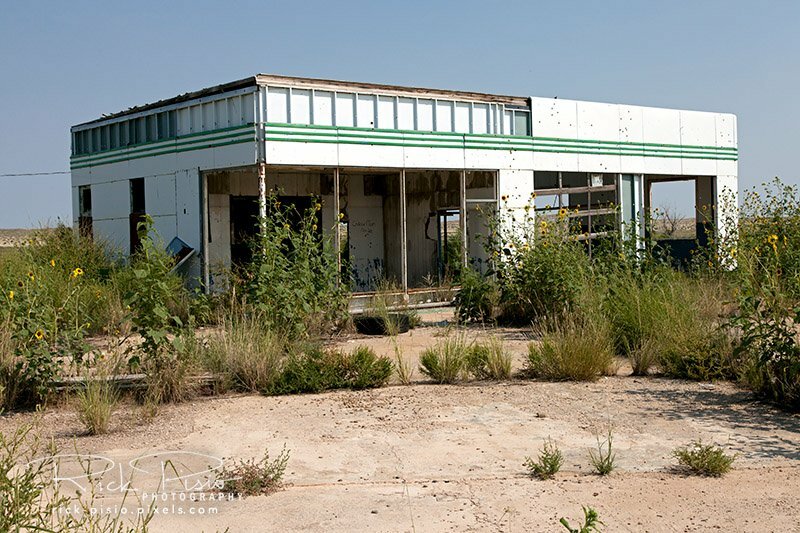 Abandoned Texaco station in Glenrio, Texas.